SANTIAGO, Chile (Jan. 12, 2018) – Luis Gagne moved into the lead Saturday in the third round of the South American Amateur. 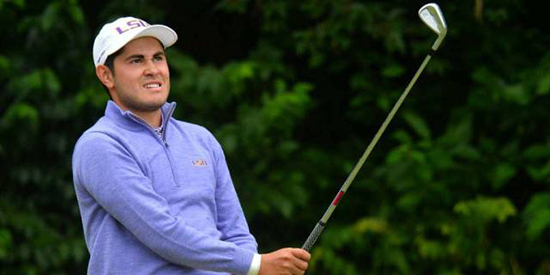 The Louisiana State University senior year student from Costa Rica will take a one-shot advantage into the final round at Club de Golf Los Leones. For Gagne, No. 50 in the World Amateur Golf Ranking, a third-round 69 included five birdies and two bogeys. The round pushed him to 7 under, one shot ahead of Englishman Thomas Plumb and Colombian Ivan Ramirez. Last summer, Gagne, 21, tied for low amateur honors at the U.S. Open. Should Gagne successfully close in on the South American title on Sunday, it could make for a nice warmup for next week’s Latin America Amateur, where a Masters invitation is on the line in the Dominican Republic. It will be his first time playing the event. As for Plumb, his best recent finishes include a fourth at the Carrick Neill Scottish Men’s Open and top-20s at the Welsh Open Stroke Play and English Men’s Amateur. Ramirez is a senior at Texas Tech. First- and second-round lead Mateo Fernandez de Oliveira has now had back-to-back rounds of 73 after opening with a 65. He slipped to 5 under and a tie for fourth with Jan Hellema. Defending champion Chris Crisologo from Canada is part of a three-man tie for sixth that includes Toto Gana, winner of the 2016 Latin America Amateur, and Horacio Carbonetti.